Shigesato Itoi is an established name in the Japanese cultural scene, but what he is known for may differ depending on who you ask. To some, the 63-year-old is one of the most acclaimed advertising copywriters, who created an astonishing body of honed and catchy slogans, claims and come-ons during Japan’s upbeat period of high economic growth in the 1970s and ’80s. Others may remember him as a talk-show host or regular guest on prime-time variety shows — while some know him as the designer of Nintendo’s popular computer game, “Mother 2” (titled “Earth Bound” for overseas). Even if none of these claims to fame rings a bell, however, movie buffs may recognize Itoi as the voice-actor of the father of Mei and Satsuki in Hayao Miyazaki’s popular animation film “My Neighbor Totoro”; while TV fans may know of him as the real-life husband of actress Kanako Higuchi, who plays the mother of the family in mobile-phone company Softbank’s ongoing super-cult “Otosan” ad series. Over the past 14 years, however, Itoi’s work has centered on his role as editor-in-chief of Hobo Nikkan Itoi Shimbun (Almost-Daily Itoi Newspaper), his own corner of the Internet. Despite his use of the word “shimbun” (newspaper) in the title of his media organ, Itoi’s version is far removed from conventional newspapers at the basic level of it not carrying news reports per se. Nor does it rely on wire services such as Kyodo, AP, Reuters or whatever. But the stories on Hobonichi, as it is known, are original and very engaging. 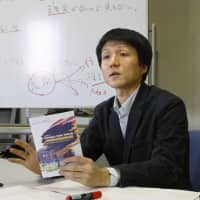 In a recent segment, for example, Itoi moderated a discussion between former Prime Minister Morihiro Hosokawa, gardener Seijun Nishihata and Yuji Kishi, a Keio University natural science professor, about how to revive the forests in Honshu’s northeastern Tohoku region. Meanwhile, other recent features on Hobonichi — which attracts more than 1 million page views every day — have included a couple of the 49 staffers interviewing 94-year-old Masazo Takenami, a resident of Honshu’s far-northern Aomori Prefecture, who has kept a picture diary for 56 years. Then there has been a series of funny stories from readers about what they tell their kids to get them to listen to them. Long before Hobonichi, though, and despite his outstanding success, Itoi distanced himself from advertising in the early 1990s when he became disillusioned with the way creativity in the field was thrust into a back seat behind costs as the economic bubble burst. In fact his response was the classic “gone fishin’ ” — which is precisely how he spent his time while pondering how to fashion an environment free of sponsors and bottom lines in which he could realize his own initiatives. Change came in 1997, when Itoi encountered the then-new world of the Internet. 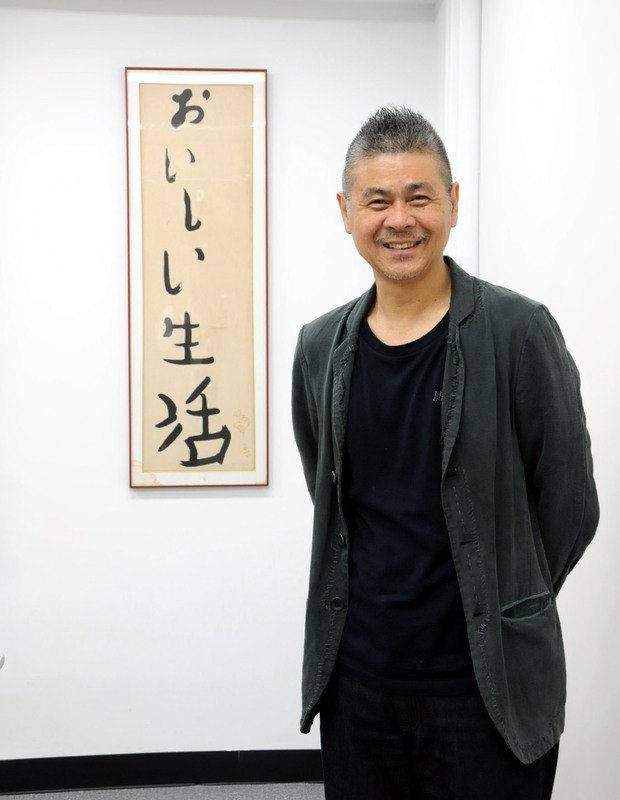 Itoi says he was pleasantly shocked and excited to discover how it was transforming people’s way of gathering and providing information — as well as how they connected with each other. So, on his 49th birthday, on Nov. 10 that year, Itoi bought his first Macintosh computer and started exploring cyberspace in earnest, convinced that the Internet would allow him to actualize his ideal. 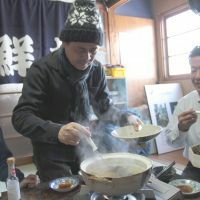 He didn’t waste much time getting going, because, on June 6, 1998, he launched the Hobonichi website — including “almost daily” in the title as a ready-made excuse if it couldn’t be updated some times. To date, though, Hobonichi has never missed a day in delivering Itoi’s essays and its wide spectrum of other content — whether interviews with celebrities and features about them, or material drawn from unknown or little-known people involved in handicrafts, cooking projects, photography or whatever. Also, ever since the March 2011 disasters, Hobonichi has consistently focused on stories about how people in the affected parts of Tohoku have been recovering. Another major, and defining, characteristic of Hobonichi is that as a matter of policy it does not carry any advertising. Instead, its revenue comes from marketing Hobonichi-brand products including T-shirts, towels and curry rice plates. 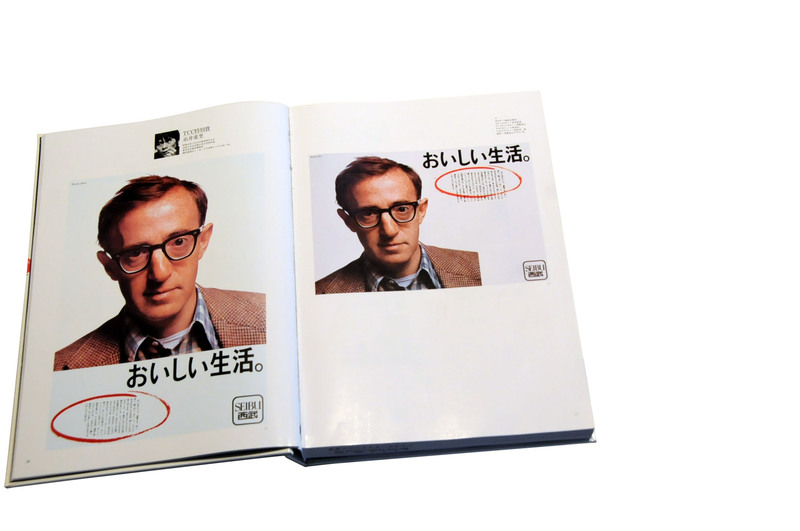 And, of course, the stories behind developing those original products feature on Hobonichi, too. Despite completely bucking the regular media’s ad-based business model, in fiscal 2011, the Hobonichi company posted ¥2.8 billion in sales, and a net income of ¥300 million — bottom-line proof that it could do it its way, even in Japan’s super-sluggish economy. 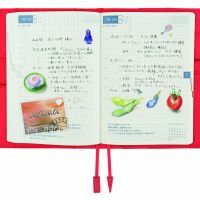 Among the most successful Hobonichi product is the Hobonichi Techo, an original daily schedule planner spanning a calendar year, which sold a surprising 460,000 copies in 2011. However, that figure’s only likely to rise this year, the 12th year of publication, as an English-language version of the planner made its debut on the market. “In a nutshell, we want to go global (with the Hobonichi Techo),” Itoi says. 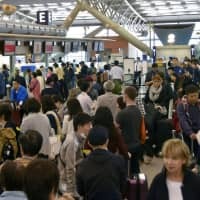 On a recent afternoon, Itoi talked to The Japan Times at his office in Tokyo’s posh Aoyama district in Minato Ward and shared his thoughts on Hobonichi, the various Hobonichi projects, copy-writing — and the impact of last year’s Great East Japan Earthquake and the tsunami and nuclear crisis it triggered. I want to ask you about your successful Hobonichi Techo. Did you especially like daily planners, and how did the idea of creating an original one come about? I’d not been able to establish a good relationship with planners when I had them myself. I repeatedly started to use one and ended up abandoning it. It seemed as though many people had similar experiences. When I was young, I didn’t really think it was necessary to record things. I used to think people who took notes were fools! (laughs). I was someone who pretended to be wise, and I thought that things we forget were just things we forget — so they weren’t important. But then later I used to write down all sorts of things, and I was vaguely aware that the stuff I scribbled down often turned out to be useful when I revisited it. Eventually, I came to think that it would be convenient if I could integrate all of those memos so it’d be easier to read over them again. Then at one point I realized that dates do help, because as long as the dates are there as a structure, you can’t be messy and use the planner the following year, too. We came up with one that dedicates a whole page for a day, big enough to write an essay on it. I also wanted a cover with a cool design that made you feel good about carrying it — and I made sure the planner had side pockets where you could put business cards, bank notes and things. So, from the start we were able to create a planner that has all you need during a lunch break. It was the planner I needed. Do you see a connection between the rising sales of the planner and people visiting the Hobonichi website? Yes, definitely. Quite a lot of people encounter the planner first and then “Hobonichi.” You’d think it would be the other way around, but I’ve long hoped for this to happen. When I started Hobonichi in 1998, there weren’t many people who knew what the Internet was. Eventually more people began to have access, but still today I don’t think the Internet has taken over the world. I believe that at the core of society there are people who get their information from newspapers. Even today, we need to remind ourselves that there are people who don’t know what Hobonichi is. In that regard, among the things people physically encounter, everyone who uses the planner will spend a whole year with it. It’s a joy to be able to meet with many people that way through the work we do. The more we do it, the more I feel good about releasing this planner. There are really few things that people spend an entire year with. Last year, after the earthquake, we heard from some tsunami victims that they were hoping to get the planner because the ones they had were washed away. So we placed an announcement on the Hobonichi website saying we would give disaster victims planners for free. That was something positive we could do. At the time, we weren’t sure how many people we would be able to reach, but it turned out that a surprising 1,400 people contacted us. In the thank-you e-mails we received, many spoke of how losing the planner had had a big impact on them. They also said how happy they were to get back the same planner. I was touched. I’ve traveled around the country and have asked many users to show me how they are using their planners. But when we saw how so many people were desperate to get this planner after the experience of such disasters, we felt proud of the work we do. We shared the e-mails with the people at the factory that makes the planners, and they were also happy to see that. Let me ask you about your work as a copywriter. Why did you choose that profession? I couldn’t find any other job. I dropped out of university. So there wasn’t anything waiting for me. That was right in the middle of the 1960s student movement, and I participated in that in my freshman year. But I dropped out in my second year. I quit just to get away from it all; I didn’t even want to meet my comrades. So I had to start looking for a job, but I didn’t know how. I thought that acquiring some kind of skill should help, and I started to get information from different schools. Back then, I had never heard of copywriters. But when a junior high school classmate told me that she was attending a school to become one, I thought that was for me. It was clear to me that I was more qualified than her, because I was anyway already constantly trying to come up with words to make people happy. I thought that was what I wanted to do and so I went to a school to become a copywriter. Were you good at writing as a child? No, I was completely the opposite. I wasn’t good at writing essays about fixed things. I hated them. But I really enjoyed it when we were tasked to write personifications. School teachers always like it when students included frank and outspoken things in their essays. “Parents, you guys were fighting, weren’t you? Your child was watching” — you know, they like things like that. But I hated writing those things because I grew up in a complicated family situation. On the other hand, if we were given a chance to write an essay titled “I am an eraser,” I could do that because I could make up everything. I still remember clearly how much I enjoyed doing that. Among the many advertising slogans you wrote, “Oishii seikatsu” (“Delicious life”) for Seibu department stores in 1983 is regarded as one of the most outstanding. Advertising students and historians have often said that your copy-writing was not simply words written for an ad, but it often described and encapsulated the times. When you were a copywriter, how did you see your role? The role of copywriters can change slightly with each assignment. Copy-writing generally is regarded as using words to promote sales, but good copy-writing alone won’t necessarily do that. A company has to do more to achieve that, and so things are done comprehensively. When I came up with “Delicious life,” we’d had the bubble economy time of high economic growth for years, and society as a whole was used to comparing things to choose the best. But I thought comparing was dull. Department stores are a very interesting place. They market pickles on the basement floor, and on the eighth floor they sell jewelry. If you are not interested in buying jewelry, there’s no point going up to that floor; while if you want pickles, you just need to go to the basement. So you don’t show a customer who’s come to buy jewelry the pickles — but if that customer who wants some jewelry sees the pickles, they might want to try them, too. These things vary depending on the individual and the situation, all customers experience pleasure when they encounter something appealing they hadn’t considered buying. I used the word “delicious” to express all that, suggesting that the store offers a lifestyle that runs counter to those comparative-choice values. Consequently, the customer may be able to form an idea that all the floors in the department store are nice, and so they may decide to just visit one floor they’d never gone to before. Or maybe the department store will become a meaningful place to visit even if you don’t buy anything. Hobonichi carries no advertising, and instead you have been making your profits from the original items marketed on the website. Did you think you were going to succeed that way from the start? I think the most important thing was that I started Hobonichi not expecting to make money. If I had thought of living off it, I would probably have had it carry ads or I’d have get companies involved (as sponsors) to turn a profit from the start. However, Hobonichi probably worked out well because we didn’t do any of those things — though I have said from the beginning that we should create a virtual Ginza (Tokyo’s most glitzy and high-end shopping street), I just knew that. The reason why everybody wants to own a shop in Ginza is because people go there anyway, whether you promote yourself or not. Nobody will visit you in the mountains, even if you build a spectacular store there. It’s an amazing thing to own a place where people will visit without you luring them in. It took many years and people to make Ginza what it is, but on the Internet if you want to create a Ginza you can try by starting from something the size of Togoshi Ginza (a local shopping street in Tokyo’s Shinagawa Ward) and build it up to become like the Ginza. 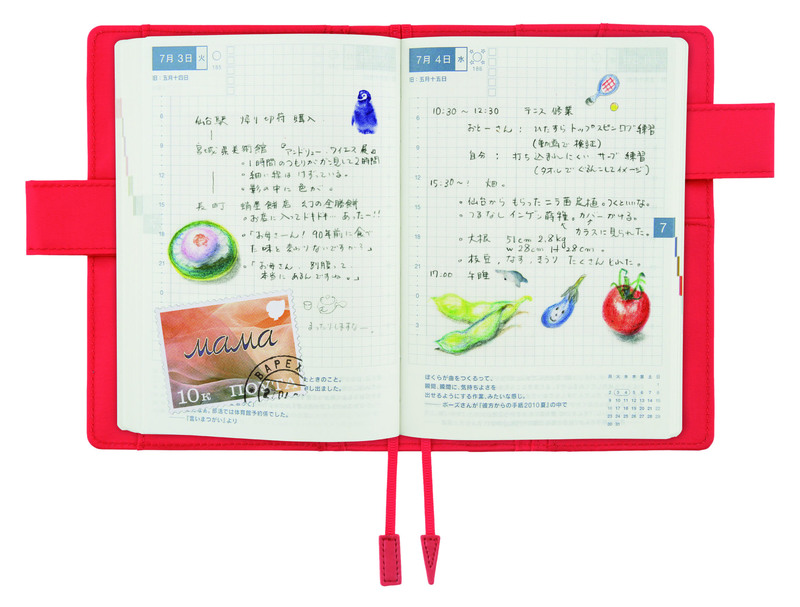 At Hobonichi, you are involved in both content creation and top management. So, what is Hobonichi for you today: You call it a “shimbun” (newspaper), but do you think of it more as a business? I most definitely think of it as a newspaper. When I first came up with that format to create a newspaper, I somehow felt sure it would work out well. I mean, as long as it is a newspaper, we can do everything from business to volunteering. That’s an amazing format. Most conventional newspapers are struggling to survive as circulation and advertising both go down. Online, meanwhile, an increasing number are erecting pay walls around their website’s content. What do you make of all this? Well, things that are old and may seem in danger of disappearing always have attractive elements. But if the people in charge haven’t been able to identify those elements, then that could spell trouble. If you compare hand-written and typed information, the hand-written version will seem more precious and make you happier because it feels heartfelt even if, functionally, it is inferior because the writing is bad and hard to read. As regards the heart being happier, though, I think many newspapers have forgotten how readers feel when they read the paper, and they just think it’s a plate on which to communicate information. But think about ceramic plates. There are different kinds of porcelain, and some plates are made by well-known potters. The plate is part of the dish, so there must be something good about it. Unless newspapers think hard about what that is — and re-evaluate their strengths — they will be defeated because, functionally, they may be inferior to other platforms people have available today. I also think it’s important that readers can finish reading in a shorter time. Not many people can get through all the stories in a newspaper in one day. Maybe the fact that newspapers heaped a large amount on the plate could have been a problem. It’s very difficult to really question yourself about which elements make people excited and come up with a new idea, because at some point you need to change the way you do things. The question is whether you can you handle the changes it will take to make the change. 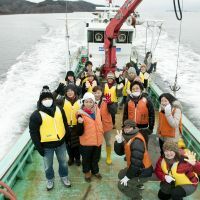 Going back to Hobonichi, in November you set up a branch office in the coastal town of Kesennuma in Miyagi Prefefecture, which was devastated by the March 11, 2011, tsunami. 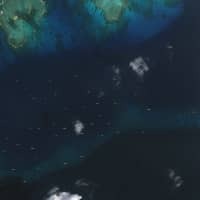 What are your ongoing projects there? One of the things we’re working on is organizing events where we invite people from across the country to come there and pitch in however they can and enjoy being with the locals. In this way there’s been all kinds of things from arts-and-crafts lessons to rakugo (comic storytelling) performances, and that’s all steadily ongoing. Another thing we’re working on is showing Kesennuma to different people such as the presidents of manufacturing companies. We’re also introducing them to the locals and to the community and seek ways they could combine their potentials. 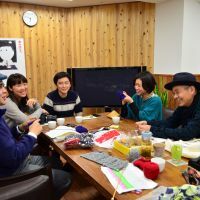 We’re also working with the local ladies on a project to establish Kesennuma as a mecca of high-quality hand-knitted items. It’s sort of like Swiss watches are the best of all watches. We want to nurture a strong brand so that people will say, “Of all the knits, this is the best!” — and want to buy ones bearing a Kesennuma tag. Perhaps it’s for the people of Kesennuma to hatch the eggs. 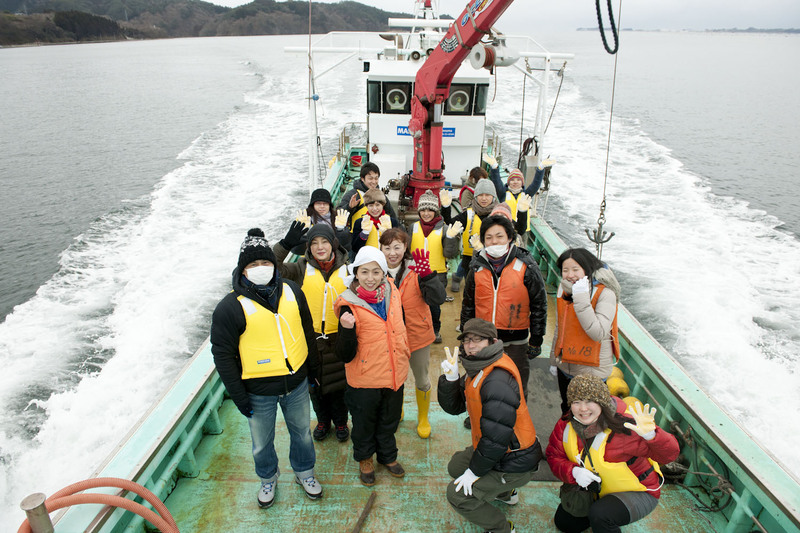 But we hope to create examples that will make people think that there is something interesting going on in Kesennuma. One of the things you wrote in your daily essay on Hobonichi right after the 3/11 earthquake was that you had a feeling that it could become an opportunity for society to change for the better. Are you seeing any changes? Unfortunately, people who have changed have changed, but people who haven’t have not. But I think that’s how these things are. Good things don’t come that easily. It’s the same with revolutions — people could be competing for power right after celebrating the success of a revolution together. We shouldn’t believe that good things can suddenly happen overnight. But one thing I can say with certainty is that my feelings have changed. I know that for sure. And I believe there are other people who can also say that they have changed. If we bring them together, adding and multiplying their energy, that’s a significant amount of power. 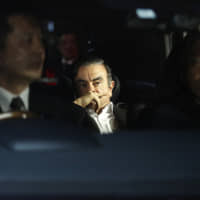 After the earthquake, I said to my crew here, “Let’s work 130 percent … and devote the 30 percent to Tohoku.” But working 30 percent extra is really exhausting and it’s impossible to maintain that level. So what’s important is — no matter if it is 10 percent, or less than 10 percent of our energy — that we continue seeking out things we can work with the locals over the long term, something we can look back on knowing it was worth doing. How do you see the change in yourself? Well, I’m not naturally a do-gooder, and I don’t really like such people. So, how should I say this? … I don’t like things that tie people down, but good things always have a tendency to do that. Major tragedies have often stemmed from clashes of people who do good things. Like war, for example. People kill others because they believe they must kill. Nobody likes to kill people because it’s fun. So I regard being a do-gooder as being a danger zone that I never really wanted to enter. But I discovered that there are ways using our creative skills to help others without creating complications anywhere. What we’re doing right now are actually things like coming up with ideas, looking for new motivations for people who can’t deal with the situation, or getting someone who says “this is really bothersome” to be involved in new projects. We’ve been able to move several things forward in a mature way, and even though it’s very tiring I feel it’s very rewarding and enjoyable. When you go fishing, you need to be innovative and patient; it’s very similar to that. And I find that it’s worth devoting your effort in that way to such things. Turning to society, one of the changes we’re seeing is that many citizens have started participating in antinuclear power demonstrations. You have experience having taken part in student demonstrations for a year, so I wonder how you regard the fact that more members of the general public are now taking part? I think it’s pretty complicated. But when people were asking themselves what they should do after 3/11, and they were searching for a clear answer, the antinuclear cause was probably very easy to understand. People like what’s called a “single issue.” Things that look exciting are often presented as clear-cut single issues. But after jumping onto a single issue that looks right, the most dangerous thing is is that many people stop thinking anymore. Your chosen issue may really not be that simple at all — but you can end up not noticing that. I want to say, in a calm manner, that if you want to come up with a way to do good things, philosophy and ideas are what it takes. One of our partners in Kesennuma is a couple who run a fish-processing firm named Saikichi Shoten. They began rebuilding their business by cooking two big pots of fish a day in the kitchen at somebody else’s factory. To people who have bigger businesses, you couldn’t even call that a startup. However, the couple said their first task was to prepare the two pots daily, pack them and deliver them to people who had supported them financially to get to where they were. That is not a single issue. No profit. It was work to thank others. Just two pots. But after they worked for a year (and gradually increased their output), they were able to rebuild a temporary factory. Now, volunteers are using a corner of their space for free to help other people. So now, the place run by people who had everything washed away has become a place that other people appreciate. This is the kind of path of reality that I want to continue walking along. You came up with the name “Almost Daily” so you had a ready-made excuse to take a break, but you have continued without stopping all these years. How is this possible? I probably don’t know how to relax (laughs). I’ve been pondering on when to use this “almost” right, but I haven’t been able to use it because it’s so precious. I should just say, “Today I’m playing this card and taking the day off” — but I can’t. I used to think very often about taking the day off. But when I start a sentence writing, “Finally the day has come when I will play this card,” I want to continue writing another sentence. Then four or five more sentences follow and I end up not being able to take the day off. So I erase the first line, and an essay is completed. Maybe that’s the key. Complain if you want, and be honest to yourself and say, “I quit!” — and then the job’s done.